Through death by the sword they seized the grace of Christ. These Holy Martyrs were servants of the four tribunes that had captured the Holy Hieromartyr Peter of Alexandria (Nov. 24), who was beheaded under imperial orders. Following his martyrdom, these four tribunes believed in Christ together with their entire households, and they were martyred. Then these servants were inflamed with zeal for the faith, and they went of their own accord to Emperor Diocletian, who was in Nicomedia, together with their wives and children and nursing infants, all together numbering one thousand and three people. 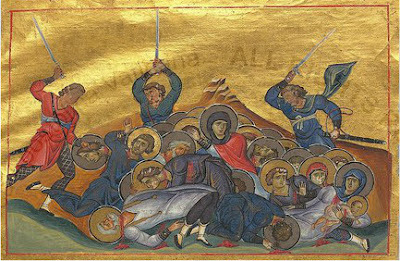 After they confessed that they were Christians, and being unpersuaded to deny Christ, they were cut to pieces with the swords of the imperial soldiers, and in this way they received crowns of martyrdom.